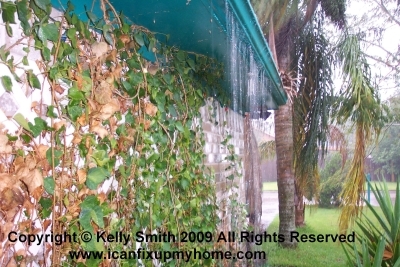 Are they a maintenance free myth or do they eliminate clogged gutters and downspouts? Do gutter guards and screens remove the maintenance hassle of seasonal cleaning? Or are supposedly maintenance free gutter covers just more salesman hype? To accomplish their stated purpose, they must keep debris, leaves, and bits of composition shingles from clogging the downspouts. So this is the predicament and the challenge faced by the product designers; to let rain water be properly channeled, while at the same time excluding evergreen pine needles, leaves, tree flower buds, and seed pods. Another concern up north is the snow and ice accumulation in the deep of winter. One classic design employs round-shaped holes. A variation on this theme are diamond-shaped knockouts. Either of these designs are somewhat efficient but they still require a regular inspection and debris-removal about four times a year. The springtime home maintenance checklist should include this chore. The junk that collects on top of the screen should in theory be able to be blown off by the wind when it is light and dry. This is the bottom line: which shape of hole is better at not grabbing and holding onto debris? This is a challenging geometry exercise which in turn depends on the geometry of the debris. For example, a rock maple leaf is much poles apart from a Ponderosa pine needle. The micro-mesh Technology does a better job for most homes. The general idea is the similar but the smaller holes mean less trapping happens and the wind does a better job of cleaning it off, meaning less work for the homeowner. A company called Gutter Glove makes this type of product. The mesh material is stainless steel and the support frame is constructed from aluminum. The end result is that the rust problem is eliminated. This type utilizes a slot configuration instead of than holes or a mesh. The concept is that rain water runs laterally across the upper surface, then enters the gutter via a slot. There is a compromise here; the slots do not exclude debris as well as the mesh does; it simply alters the shape of the waters entry point. As mentioned before, the question of whether these gutter exclusion devices will work efficiently for a homeowner is basically dependent upon the type debris that's likely to accumulate. Waterloove is one manufacturer of this type and Gutterguard is another. In other words, let the buyer beware! Many of these manufacturers hype their products as maintenance-free, but common logic will tell you that this claim simply cannot be true in the strictest sense. If they do make that claim, brand credibility inevitably suffers. Gutter guard systems arent a total solution, but they are a labor reducer. Its easy to be thankful for this on a 2 or 3 story house! 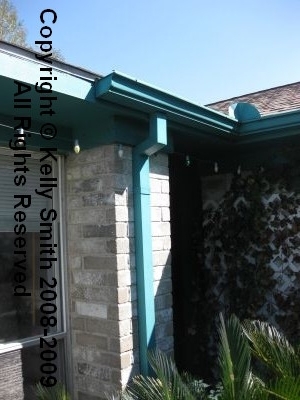 Dont forget about your rain gutter downspout. If it happens to clog up, and yes, it will; it doesnt matter what type of exclusion technology you have installed on the fascia boards; the thing will overload and massive damage will occur if drainage is impeded. Its a simple job to flush out a downspout using a high pressure garden hose sprayer or a plumbing snake if the clog is stubborn. Cleaning isnt something to be tackled on the fly; when a tropical storm or hurricane blows through its too late to get things moving. In the end, your choice of gutter style, gutter leaf guard, downspout, and rain water routing should all be considered together if possible. Rather not do the installation or cleaning job yourself? Find local ratings on who to hire for all your home projects. Angie's List makes it easy to find the best. Join today. Do you need an article written and featured on one of our sites to promote your business? Hire Me!